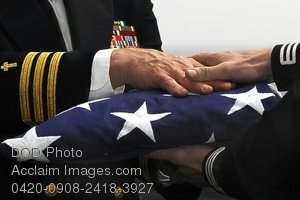 Description: Free, public domain image: Navy Commander Handing the American Flag to Another Navy Officer. U.S. Navy Cmdr. Ronald Kawczynski hands a U.S. flag to Religous Program Specialist 3rd Class David Swan during a burial-at-sea aboard the aircraft carrier USS John C. Stennis (CVN 74) Feb. 16, 2009, in the Pacific Ocean. The ship is on a scheduled six-month deployment to the Western Pacific. (U.S. Navy photo by Mass Communication Specialist 3rd Class Walter M. Wayman.